I have been compensated in the form of a Best Buy Gift Card and/or received the product/service at a reduced price or for free. The opinions in this post are 100% mine. There aren’t many TVs that make me seriously jealous of those looking to upgrade their current television set. The new LG OLED 77 Inch C8 at Best Buy just happens to be one. It is, frankly, amazing technology. We all know that today, 4K TVs exists across all television price points and even half decent HDR sets exist in all the top models. Even huge TV sizes aren’t unheard of for those with deep enough pockets and smart TVs have been commonplace in nearly every set over $500 the past few years. That’s why, today, if you ask any television aficionado about what makes a TV the best of the best, OLED is where it’s at. If you haven’t walked into an electronics store in the past few years or read any TV reviews in that same timeframe, you might not know what OLED TVs bring to the market. How about perfect blacks? There’s 8.3 million individually lit pixels on the LG C8 OLED TV with the ability to turn them on or off individually. Love the black in your old discontinued plasma TV and refuse to go the LED route? OLED is where it’s at. They actually shut off the pixel when it shows black on an OLED TV. Everyone knows you can’t get any darker than off, and with the ability to brighten or dim any pixel means that any colors on an OLED TV are nothing short of amazing. Don’t believe me? I challenge you to walk into any Best Buy across the country and compare an OLED to any conventional LED and tell me I’m wrong. If you haven’t seen an OLED TV in person, you will be blown away by the richness of its colors and its absolute blacks. The LG OLED 77 Inch C8 TV in particular is also best in class in just about every facet. 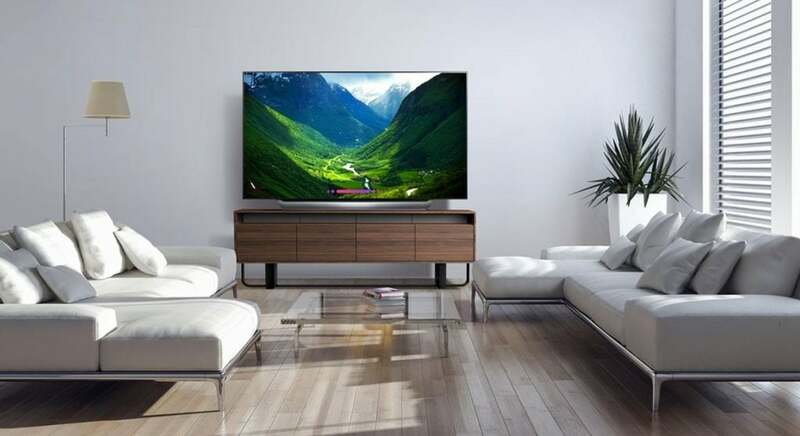 It has won dozens of awards and is ranked as one the best televisions ever on just about every best 2019 television review out there I can find. Its 4K resolution is mesmerizing in person and you won’t want to turn it off. Thanks to some very smart HDR technology it also raises the quality of every scene to 4K quality. Now that’s not a common thing. Whether you love sports, movies, monster gaming sessions or breath taking nature programs, the LG C8 77 Inch OLED TV has you covered and the huge 77 inch screen allows you to watch from nearly any angle. As OLED TVs have some of the best off angle viewing of any TVs on the market, you can place it nearly anywhere and if you’re looking to truly create a movie theatre atmosphere at home, this beautiful 77 inch TV will be the highlight in any home theatre. 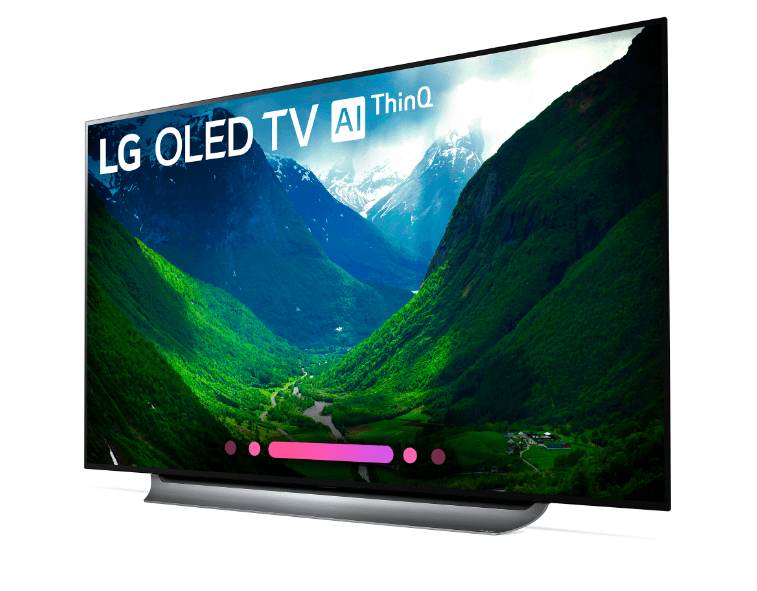 Another great feature of the LG C8 OLED, with LG’s smart AI ThinQ technology, accessing your favorite shows and programs on the LG OLED C8 TV is ridiculously easy. With built in Google Assistant, you can now just talk to control your TV. Want to watch the latest episode of Ozark on Netflix ? Just tell your TV. Want to control the volume, modify picture settings, check the weather or watch a silly cat video on YouTube, you can ask it that too. The LG C8 OLED is also fully compatible with Google Home and Amazon Alexa. If you have a smart home you can even use your TV to control other connected aspects of your house like turning down the lights, turning on the fireplace and even closing the drapes as you walk into your living room. Talk about true home cinema! 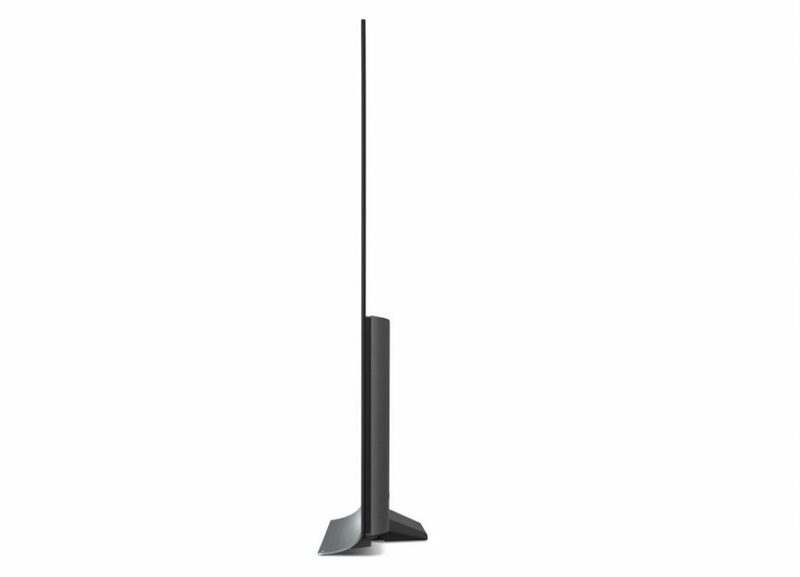 For such a thin display, the sound on the LG 77 Inch OLED C8 is hard to beat. With four 10W speakers, two 10W woofers and built in Dolby Atmos, you’ll be getting a great sounding, realistic experience that helps put you in the center of the story. Couple that with its ultra thin screen and tiny bezel and this TV won’t disappoint. 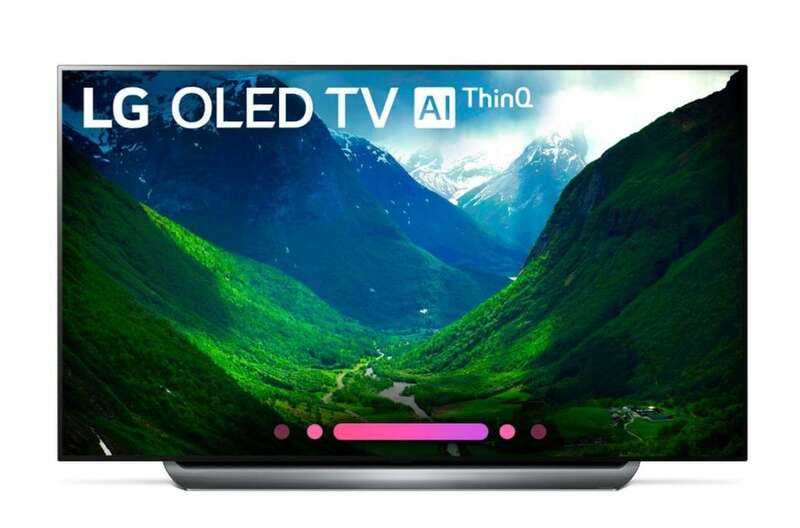 You can check out the LG OLED 77 Inch C8 TV (model OLED77C8PUA) at Best Buy. If you want something a little smaller, you can also check out the 55 inch LG OLED C8 model (OLED55C8PUA) or the 65 inch LG OLED C8 model (OLED65C8PUA). Curious about LG’s other OLED TVs? Click here. 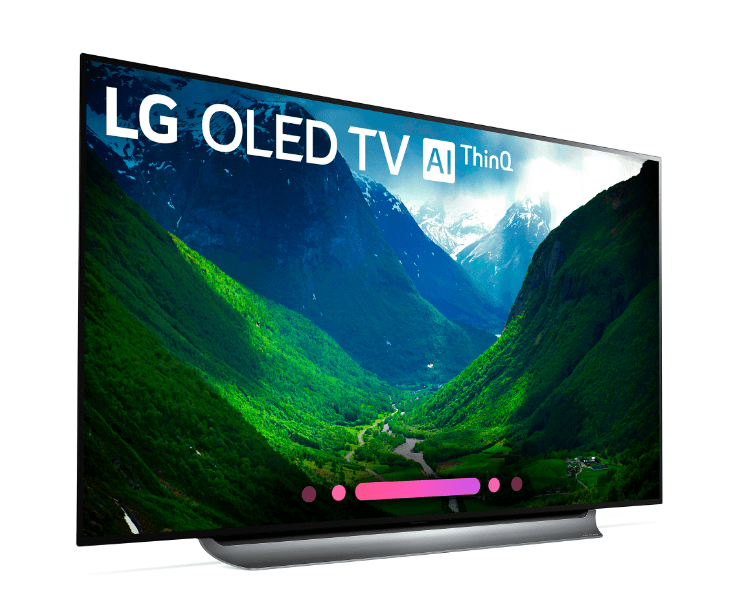 Want to save up to $500 on select LG OLED 4K TVs? Click here.